John Isner celebrates his tie-clinching win over Jo-Wilfried Tsonga. 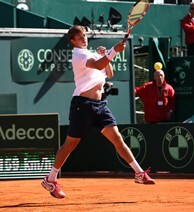 Ryan Harrison played his first career Davis Cup live matches against France. Jo-Wilfried Tsonga congratulates John Isner on his victory. ROQUEBRUNE-CAP-MARTIN, France – The U.S. Davis Cup Team might have found its new closer. For years Andy Roddick was the rock in singles for the U.S. Davis Cup Team, coming up huge time after time when the team needed him most, but after his performance the past three days against France and in the first round against Switzerland, John Isner could be on his way to being the next one. Isner came ready to play and brought his best tennis once again to defeat Jo-Wilfried Tsonga 6-3, 7-6 (4), 5-7, 6-3 and clinch the Davis Cup Quarterfinal for the U.S. over France in the best-of-five series at the Monte Carlo Country Club. It was Isner’s first tie-clinching Davis Cup victory and his fifth career Davis Cup singles win. Gilles Simon then defeated Ryan Harrison 6-2, 6-3 in a dead fifth singles rubber to make the final score 3-2 in favor of the U.S.
With the victory, Isner’s second of the tie, the U.S. Davis Cup Team advances to the semifinals for the first time since 2008 and will face Spain, who defeated Austria, away September 14-16. It is also the first time the U.S. Davis Cup Team has reached the semifinals under Jim Courier, who succeeded Patrick McEnroe as team captain in 2011. The U.S. led 2-1 heading into the final day of play Sunday, behind a doubles victory from Bob and Mike Bryan and another singles victory from Isner Friday over Simon. France earned its point of the tie with a singles victory from Tsonga over Harrison in the opening match Friday. "I was ready to go. It was as simple as that," Isner, the world No. 11, said of his clinching win. "Just as I did on Friday, I went out there and played very well. I am just very thrilled with my performance and very happy that our team is going on to the semifinals." The fourth singles match Sunday between Isner and Tsonga, the world No. 6, featured top-quality and all-court tennis from both players but it was the American who won just a few more key points, using incredible power on his forehand to put himself ahead and stay out of trouble as well as his serve, which produced 17 aces and was broken just once. His forehand also produced 27 of his 56 winners. Although his forehand and serve are still his biggest weapons, Isner has developed into an all-court player, which was on full display throughout the tie, including winning 37 of his 49 net approaches and mixing in many effective drop shots. His performance in Davis Cup continued a great stretch of play dating back to the second half of 2011, including defeats of Roger Federer in the U.S.’s first round win over Switzerland and Novak Djokovic, who was in attendance Sunday at the Monte Carlo Country Club, at the BNP Paribas Open. He thought especially that the Davis Cup win over Federer was a springboard for his strong performance in Monte Carlo. "I think the reason I played so well this weekend was because beating Roger in the first round was huge for me. Prior to that, I had not really played that great in Davis Cup. It was a huge win for me, it took a lot of pressure off me," Isner said. "I felt like I was going to play well regardless if Mardy was here," he added, referring to Mardy Fish, who had to withdraw prior to the tie due to health reasons." I was just really calm the whole weekend. I never at any point felt any nerves out there on the court. Any time that is the case, more times than not, you are going to go out there and play well." And he did more than play well, according to Courier. "He played very close to his maximum at the moment and that is what it was going to take to beat this team," Courier said of Isner. "The quality of today’s match was exceptional, I thought better even than on Friday. John is definitely continuing to improve even from the last tie. I think he played better this one. It is impressive." Against Tsonga, Isner took the lead first with one of only three total breaks of serve in the match for either player. He went up 5-3 when Tsonga double faulted on the first break point either player held. As the second set progressed, Tsonga continued to fight back challenges from Isner, saving break points in the first, third and ninth games, coming up with big shots whenever he needed them as the American applied the pressure in each of his service game. Isner faced his first break point of the match in the second game but he fought back to hold after Tsonga landed a shot wide. The set moved to the tiebreak, where Isner was able to first score the mini-break, ripping a forehand return winner down the line for a 5-4 lead and then took the ball to serve. Tsonga then hit a ball into the net for a 6-4 Isner advantage and he closed out the tightly-contested set with one of those 17 aces. "I won the first set, the second set could have gone either way," Isner said. "We both had break points in the second set and what it really came down to was I had one look at a second serve in the tiebreaker at 4-all and I played a good point." Tsonga continued to apply the pressure in the third, earning his first break point chances since early in the second set in the third game but Isner used his serve to save them both and force the Frenchmen into errors to hold for 2-1. It was Isner who made one of his few mistakes in the match in third then, at 5-all, he fought back off two break points and then held the advantage with an ace. But Tsonga hit a great slice drop shot from the baseline to bring the game to deuce and took the advantage with a passing shot down the line while on the run. On the next point, Isner hit one of his only four double faults in the match to give the Frenchman the break and he served out the set to push the match to the fourth. But Isner did not let the mistake affect him, taking the lead at 2-0 in the fourth for just his second break of the match and first since the first set. Tsonga continued to fight off Isner’s challenges, bringing the game to deuce after Isner held two break point chances but a forehand into the net gave the American the advantage and another wide gave him break and the lead. From there, Isner continued to hold steady, holding at love then in the final game, with a forehand winner to seal the victory. "I just stayed there and I was enjoying the moment," Isner said of losing the third set and how he moved on. "It is just so much fun playing out there with a crowd like that, a great crowd, on such a beautiful day. I didn’t get too frustrated, I was just enjoying it, went out there and tried to keep playing my game." But he did not feel quite ready to accept the title of closer just yet, given Roddick’s much longer Davis Cup history and 33 career wins. 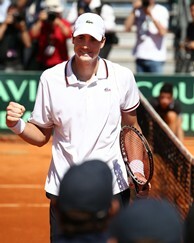 Closer or not, however, Isner led his team to victory over France, and it surely will not be the first time. "That is the first time I have ever closed out a Davis Cup tie. I think for now that title still belongs to Andy Roddick," he said. "He has done this so many times. If I can do it five, six, seven more times than maybe you can call me that but for sure that is not my title. I am just trying to help my team and that is what I have been doing." Spain will be a familiar opponent lurking ahead. They defeated the U.S. in the quarterfinals in Austin, Texas last year, and will presumably select a clay court. Having already faced a deep team in France, it doesn’t get any easier for the U.S. Spain features even deeper team depth with Rafael Nadal, David Ferrer, Nicolas Almagro, Feliciano Lopez and Fernando Verdasco all currently in the top 20. Considering how Courier has led his team to victories as the underdog in two away ties already this year, they could definitely do it again and he will prepare his team both mentally and physically, as always. "We have had the worst draw that you could possibly imagine. I am shocked that we are still in the Davis Cup this year. Honestly at the beginning of the year, it was my hope that we would be able to stay in the World Group," Courier said. "Switzerland away, you think you probably lose that match. Here (against France) away, you think, we got past Switzerland, maybe we have a chance, but we probably lose this one as well. "Spain, we probably lose it on paper but they don’t play them on paper," he added. "We have to play it out here and we have players who are capable and passionate and hungry. We are definitely going to be the underdog once again but we will be ready to play."